When King Henry VIII (Robert Shaw) seeks approval to divorce his aging wife Catherine of Aragon who could not bear him a son, and marry his mistress Anne Boleyn, the Pope and the Roman Catholic Church stand in his way. Henry VIII’s new Chancellor of England and Cardinal–Sir Thomas More (Paul Scofield)—stands in his way as well. Henry VIII wants Sir Thomas More’s blessing in his action but does not get it as Sir Thomas More, a good Catholic and Cardinal, will not go along with such heresy. More resigns as chancellor, seeking to live out his life as a private citizen, but Henry VIII will settle for nothing less than More’s public approval of his headstrong course. Sir Thomas refuses to either endorse or denounce the King’s action, and remains a man of principle. Great effort is made to convince More to change his stance on Henry VIII’s action. One of More’s rivals, Thomas Cromwell (Leo McKern); another religious, Cardinal Wolsey (Orson Welles); and The Duke of Norfolk (Nigel Davenport) all take their turns at More. Sir Thomas More was a very smart and savvy—as well as principled—man. Henry VIII gets every person of any consequence in England to sign his oath (the Act of Supremacy), endorsing his action, except Sir Thomas who will not sign, and remains silent as to the reason why he will not sign. Cromwell is an English statesman and the chief minister to King Henry VIII. It is Cromwell who presides over King Henry’s divorce from Catherine of Aragon in 1533 and Henry’s subsequent break with the Roman Catholic Church. When More proves himself to be loyal to King Henry VIII by not speaking out against him and also shows himself to be a loyal subject by not inciting rebellion, Cromwell appears to prosecute Sir Thomas out of personal spite. In the end, Sir Thomas is the only person in England who will die for his principles, and commit himself to God for judgment. He is betrayed by an ambitious, lower level appointed attorney general, Richard (John Hurt), whose outright lie condemns Sir Thomas to be beheaded. Sir Thomas More loses his head (no pun intended) but most importantly, not his soul. Sir Thomas is later canonized as Saint Thomas More by the Roman Catholic Church. Henry VIII subsequently dies of syphilis, and the evil Thomas Cromwell who orchestrates Sir Thomas More’s tragic demise is himself judged a traitor to England 5 years later and is also beheaded. The riff subsequently leads to England‘s split from the Roman Catholic Church and the creation of the Anglican Church, the Church of England. A Man for All Seasons does not deviate from the truth of Sir Thomas More’s stance, and as such provides a role model for acting with right thinking and right motives, even at the cost of one’s life. What makes A Man for All Seasons even more impressive is that the plot for the movie is based on the true story of Sir Thomas More. Sir Thomas More was a scholar and statesman who became the leading humanist of the Renaissance Era. A Man for All Seasons is a story about everything that is right in England and life (Sir Thomas More’s integrity to his principles) and everything that is wrong in England and life (greed, avarice, lust, lying, cheating, stealing, the corruption of power, and the corruption of religious leaders). A Man for All Seasons was writer Robert Bolt’s greatest success, first as a play and then as the screenplay for its 1966 movie release following a successful Broadway run. Bolt’s 16th Century period piece has exacting details of the era. A Man for All Seasons would win 6 Oscars at the 1967 Academy Awards: Best Picture (Fred Zinnemann), Best Director (Fred Zinnemann), Best Writing (Robert Bolt), Best Actor (Paul Scofield), Best Cinematography (Ted Moore) and Best Costume Design (Elizabeth Haffenden and Joan Bridge). The film also received Oscar nominations for Best Supporting Actor (Robert Shaw) and Best Supporting Actress (Wendy Hiller as Sir Thomas More’s wife Alice). In addition the movie garnered another 27 wins and 5 nominations, including Golden Globe wins for Best Picture, Best Director, Best Screenplay and Best Actor and a nomination for Best Supporting Actor. Interestingly, Charlton Heston lobbied heavily for the role of Sir Thomas More, but was not seriously considered. Richard Burton was offered the part and turned it down. 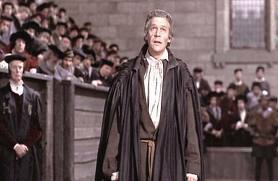 The producers originally wanted Laurence Olivier as Thomas More and Alec Guinness as Wosley, but Director Fred Zinnemann insisted on Paul Scofield and Orson Welles in the roles. The rest is history. Zinnemann obviously knew how to direct a great film and a huge box office success. PREVIOUS POST Previous post: What Are You Thankful For?